As dusk falls, the muted shifting colors of the sky appear reflected on a brownish cream limestone terrain tinged with age, carrying within it stories of an untold past. Random lights, like scattered moonlight, dance across its labyrinthine facade replete with dark openings, hinting at a presence silently watching the observer back. At first encounter, I felt at once awe struck and mystified. For this place was not like anywhere else I had seen in Italy. This was the Sassi of Matera, as I had first seen it in the Summer of 1998. It was the final destination during a program abroad in Italy, which I pursued while studying for my undergraduate degree in Architecture. Compared to the other towns and cities we stayed in, Matera was the one I had the most visceral response to. The very first thing I did, when we arrived here in the dead of night and were being hurried into our hotel rooms within the Sassi, was to stop and write a few words about the striking landscape I was witnessing. And the last thing I did before leaving, once again in the depth of night, was paint myself a final watercolor of the Sassi. Perhaps, through both my words and watercolors, I wanted to have keep memories of my own personal impressions of this place. I returned home not only with these, but with an affinity towards the Sassi that I could not name or fully comprehend. 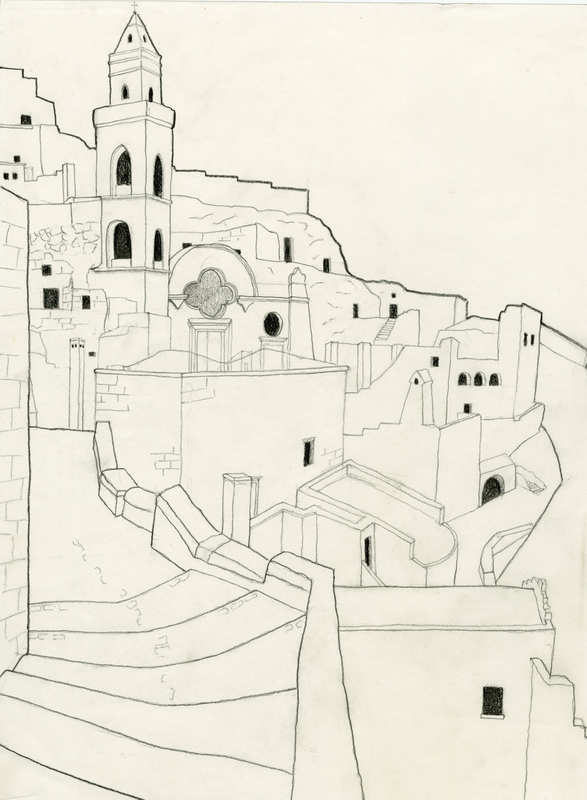 Several years later, I learned about a Historic Preservation program that was taking place in the Sassi of Matera, and I hastened at the opportunity to be a part of it. My knowledge, appreciation, and understanding of the built form of the Sassi, along with its history, deepened considerably as a result of this study. I learned that while the Sassi’s outward form had largely remained the same, perceptions of it have varied quite drastically. So much so that it had once been labeled a “national shame.” This was due in part to the writings of Carlo Levi. Levi, exiled to the South of Italy in 1935 due to his anti-fascist activities, had visited and written about the Sassi in his book, Christ Stopped at Eboli. He described the Sassi as a place of deep poverty; a malaria ridden place that was like “a schoolboy's idea of Dante's Inferno." Indeed, back then, living conditions in the Sassi were not only primitive, but far from sanitary. Homes were overcrowded due to limitations on the expansion needed to accommodate increasing populations, with work animals often being kept within the dwellings as a means of providing warmth. The Sassi were eventually completely abandoned; its residents forced to relocate to a newly built town, La Martella, meant to modernize their way of living. It wasn’t until much later that the site was appreciated for its unique built form; a dynamic coexistence of the natural and manmade environment, for its continued and varied inhabitation over more than two millennia, and for its similarities to other significant cave settlements such as Cappadocia in Turkey. This eventually lead to the Sassi’s inscription as a UNESCO world heritage site in 1993. My next two visits to Matera were solo travels, which allowed me to have a deeper experience of the local culture. I also felt that during these last two visits, the Sassi revealed more of those parts of itself to me that had initially piqued my curiosity, and have thus stayed with me the most. Much of this was a result of my encounters with the locals. There was an untethered hospitality, the likes of which I had not seen anywhere else in Italy. It was something that I knew and felt was precious. I remember several of these encounters quite fondly. There was a middle aged women who kept the cathedral with whom I had several exchanges around the topic of faith with my very basic Italian; the limitations of our words perhaps being what allowed the conversations to be so tender. There was the family run restaurant, in which the mother prepared the meals, the father welcomed the guests, and the son waited on the tables. I was pleased to learn that it functioned without a menu, catering instead to the specific tastes and delights of its guests. I ordered my meal and, after being served, the mother would now and then peek in from the small opening facing the kitchen and we would have brief non verbal exchanges. She would look my way as if to observe any reactions, I would nod and smile my delight at her culinary skills, and she would enthusiastically return the same friendly gesture as a means of showing her appreciation. In another restaurant, there worked a wide eyed middle aged man with his cat always nearby, who insisted on treating me to the gift of desert. There was the Artist who works on the carro used during the annual Festa della Bruna - which I had the pleasure of witnessing - who I had gone to visit in order to learn more about his craft. Days later, when he happened to see me again, he enthusiastically made a whimsical drawing of the carro for me in my sketchbook. There was the elderly local scholar whose door I knocked on, who warmly shared more about his town and culture with someone looking to deepen their understanding of it. While most of the faces, names, and exact words of the people I met in Matera have faded, the memories and warmth of these encounters still remains. I was also blessed to receive small gifts from many of the people I met along my winding path through the Sassi. All of these treasures, I keep safe with me, as they help preserve Matera how I choose to remember it. They include a book of hymns, a book about Paola Renata Carboni, a book about sculptures, a collection of poems, photographs of a monastery, postcards, and a letter from a stranger, whose meaning has in some ways graced my life journey to this day. to be part of the family made up of the many families content with simplicity, content with each other. that the mystery, the quiet, the still might be gone. to somehow preserve something that is constantly transforming. Being that I had been to Matera only a few months prior to writing this and had, even within that short period of time, felt a sense of urgency in hoping the town would hold onto its culture, is telling. It has now been 15 years since my last visit. This year, Matera has been named one of the two 2019 European Capitals of Culture. As part of this recognition there are several cultural events taking place in the town this year, such as art exhibitions, lectures, and performances, including one by a self proclaimed “dervish in progress,” many of which cross cultural borders. In addition, I have also recently come across several Instagram photographs, being posted by travelers, of a “luxury” hotel within the Sassi. While “luxury” is indeed in sharp contrast to the perception that “national shame” once conveyed, I wonder how a local resident who may have experienced day to day life in the more primitive days of the Sassi would perceive it. The Sassi indeed have continually evolved to changing needs and times. I see this as a testament to its unique form, which one would not intuitively perceive as adaptable. And I would not claim to know if Matera’s rise in tourism and recognition from the international community is something that will be beneficial to the Sassi and the locals in the long term. What I can share however, is my belief that a culture’s most prized possession is pride in its own heritage. If it begins to cater too often to the tastes and interests of outsiders, it perhaps begins to ironically lose some of what initially made it so appealing. While I do not know how Matera looks and feels today, save for small online glimpses, for now I have chosen not to return. Instead, I wish to preserve the memories of how I experienced it. 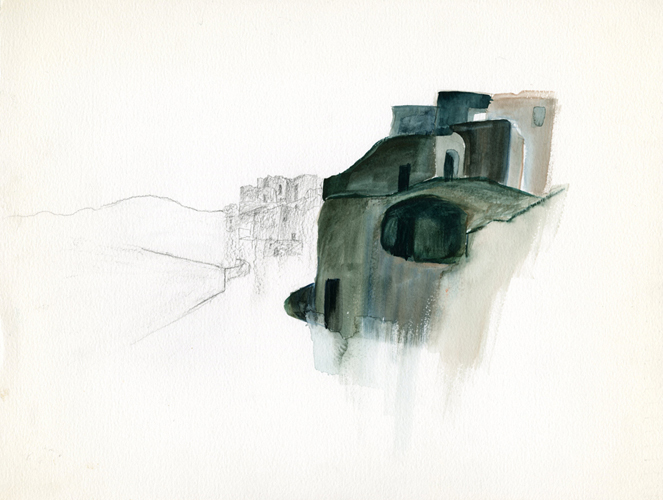 I will cherish the words I wrote, the drawings and paintings I made, the photographs I took, and the encounters I had, and will continue to paint watercolors of my memories of Matera. All of these are a testament to how I feel the town welcomed and revealed a small part of itself to me. And to those who may wish to witness and experience Matera for themselves, I will close in sharing that the story of this town is one that is layered with much history, varied meanings, and sometimes solemn, sometimes reverential, yet often poetic stories, that I feel many of the locals carry as strength, within them. It is my hope that these stories, and the vestiges of times long gone which are inscribed within the Sassi’s stones for the careful observer, will not only not go unnoticed in the current excitement of what is now being offered in Matera, but perhaps in some way be enriched by it.